THIS is my all-time favorite smoothie recipe and I consume this at least 3x a week. My freezer is always filled with the exact ingredients I need to pull it together at a moments notice. Yes, there is sugar in it, but only natural sugar, directly from fruit and not processed. (Other than in my blender.) I do prefer this as breakfast on high energy days, such as before my kettlebell classes, or prior to meeting up with Coach. It seems to give me an added boost and I utilize those natural sugars in the best way possible. 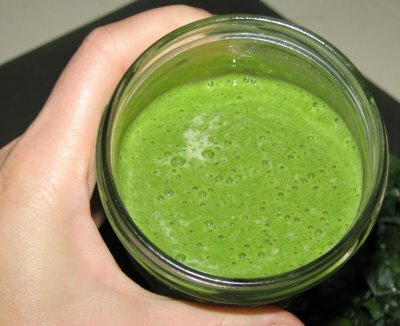 Be forewarned: it is GREEN … more green than a shamrock shake … but it is yummy. The odd ingredients really pull together to make a fantastic smoothie. Enjoy! I generally start by blending the kale and almond milk together, then slowly add the dates and let it run for a while. Then add the almond butter and banana and process until smooth. If you want it colder, add 1/2 cup ice chips. Divide into 2 cups and enjoy with someone else. It makes enough for 2 … or on those heavy workout days I might just drink the whole thing myself. Tip: When I bring home a bunch of kale, I divide it up right away and put it into freezer bags, and store in the freezer. This way the kale doesn’t go bad and I can just pull a bag out when I need it. I also peel and place my bananas into a freezer bag to be pulled out individually as needed. Having these items frozen also negates the need for ice chips.